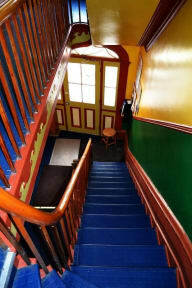 Right in the heart of Old Quebec, Auberge de la Paix, founded in 1972, is the oldest youth hostel of the Old Capital, and the most convivial and affordable in the area. If we only had one tip to make, it would be to come visit us! The hostel is located in the heart of the historical district, it's grooving with things to do around, there is no chance you'll get bored! 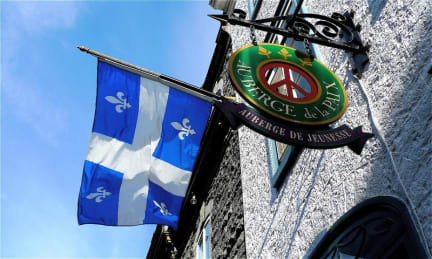 Auberge de la Paix youth hostel was founded in Quebec in 1972, mainly to provide travelers with accommodation and services at a modest cost. In 2012 it celebrated its fortieth anniversary of operation. Like similar non-profit organizations, it came out from a wide counter-cultural movement that symbolized a way of living, learning, communicating, and opening to the world. Its original project was also meant to express a concept that emerged long before those models. Indeed, it has certain similarities to the 'night shelter' that has not changed since the Middle Age pilgrims. In fact, at the end of their journey, tired travelers stopping at the hostel wish to rest themselves in an inviting, quiet and neat place. Ever since, Auberge de la Paix has been increasingly popular with customers who favor social interaction with its staff members in a cool and relaxed atmosphere. Its firmly established reputation allows travelers from all over the world to appreciate its receptiveness and promptness as well as successive improvements. - You must call us the day before or on the same day if you're to arrive after 5 PM. It's especially important when the hostel is full : if you're not there and didn't call by 5 PM, we can decide to cancel the reservation to free the bed for people in the waiting list. - We accept cash - in canadian dollars or major Credit Cards. Traveler's checks are fine, as long as they are in canadian dollars. - You need to pay at least for the total cost of the first night, on arrival. - Linen are included in the price but you can bring you own sheets / sleeping bag if you prefer. We provide pillows, of course, and towels on demand, free of charge. We also provide blankets on demands. Please note that we ask for a 5$ deposit per group of travelers that will be refund on departure. - You need to provide a valid ID with photo (anything issued by an official body). - Cancellations are accepted if made before 5 PM on the day prior the arrival date. Otherwise, the cost for the first night will be billed to you. - Every bed has a locker, right in the dorms. You can bring a padlock to secure your things (we also sell them if you need one). - We have a full-equipped kitchen at your disposal. There is a common fridge to keep your foods chill, but no freezer. - In winter season, you can bring a pair of slippers or use those we provide. O lugar mais agradável que estive, simples porém aconchegante, equipe atenciosa e acolhedora, se esforçavam pra me ajudar mesmo eu não sabendo falar as 2 línguas locais, café da manhã legal, eu recomendo! Otima localização. Ambiente seguro e confortavel. Ótimo local, bem próximo das principais atrações de Quebec (City), sendo possível fazer quase tudo a pé. A equipe é muito atenciosa, e o local é bastante tranquilo. O prédio é um pouco antigo, sem elevador, mas nada que incomode. In general the hostel is very good. But when it comes to the bathrooms it gets very complicated. The showers are timed and most of the times the water is cold, definitely not good when the temperature outside is around -10℃ 😔 I would expect something better paying 25$ per night. Stayed in this hotel in a female bedroom (6 beds). The room was ok, exceto for the bed size (small) and the awful blanket. The breakfeast is simple. i could get by all that. But in july 1 one guy entered the hostel (its open during the day) and stoled 2 laptops from other girls and 550 canadian dolars from me. He broke my padlock and took the money from inside my locker. Horrible experience, police arrived during late hours, staff was lost and this almost destroyed my trip. It's not safe. RUN!